If you’re in the mood for some waffles, burgers and hash browns and don’t fancy spending a lot of money, there are few better options than Waffle House. Yes, this Southern diner chain isn’t fancy and sure is cheap. But cheap doesn’t mean it isn’t any good, and there’s a reason why a lot of folks love it. 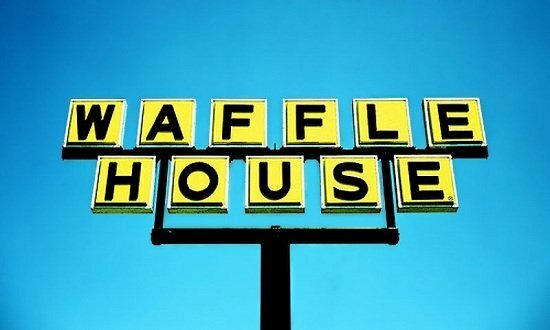 With more than 1,700 locations, Waffle House has attained legendary status in the US, not bad for a diner that began in 1955 in Avondale, Georgia. 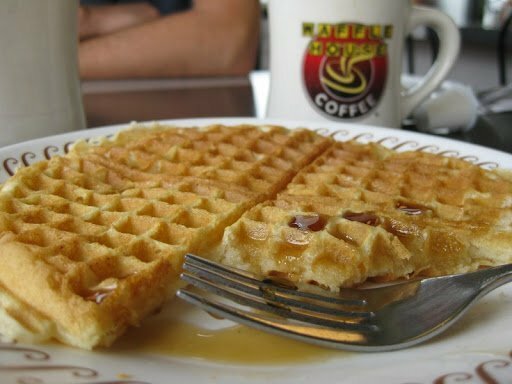 As anyone from the South can tell you, Waffle House was built from the ground up as a breakfast diner, and many people go there for that reason. But there’s really more to the place than that as it actually has a full menu with Texas Melts, sandwiches, sides (the $2.55 Bacon regular and $3.90 Country Ham are pretty good), and as you might expect from a good diner your meal is prepared and cooked quickly. Waffle House is of course known for their breakfast waffles, and they certainly offer great value for your buck with the Waffle Single at $2.95, the Double at $3.95, and for just another dollar you can add eggs on the side and for a couple more dollars you can have bacon or sausages with it. Their sausage and egg sandwich cost only $3.75 as do their Bacon Egg & Cheese Texas Melt. But as noted earlier there’s more to the place than just tasty waffles, as their burger lineup isn’t bad with a $1 hamburger, a cheeseburger with double patties and a few more options. Regardless of what you order, you are assured all their burgers are 100% Angus and you get the usual pickles, lettuce and mayo, and you can also get some grilled onions and tomato. For just $4.30 you get the Double Angus Cheeseburger with nicely melted cheese between two patties and some good onions under your burger. Their burger patties are pre-shaped and cooked quickly so it’s served melting, hot and dripping with juices as any good cheeseburger ought to. Add some hash browns and you’re in for a good meal. These hash browns by the way, are the reason why there aren’t any fries at Waffle House, and really there’s no need for it. Next to the waffles (or probably more than them) the diner is known for their highly customizable hash browns, shredded potatoes which you can have in a million ways. There are several methods listed on the menu but they can be tweaked in other ways by adding bacon, egg, Tabasco, ketchup and so on. Plus you can specify how well done the browns are going to be and different preparation methods can be used. With so many options, who needs fries? 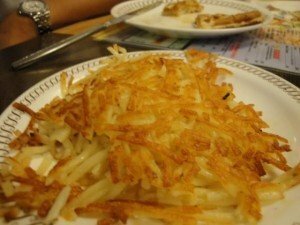 Waffle House is also known for the unique lingo they use for their menu, with the most popular being the “scattered, smothered and covered” and “All the Way”. “All the Way’ hash browns mean the browns are scattered around the grill, with onions, grilled ham in melted cheese, jalapenos, chili with grilled mushrooms and some sausage gravy if you want. 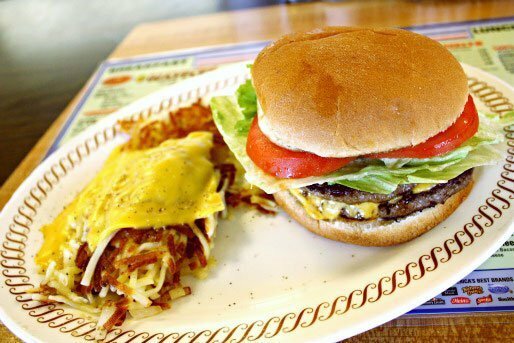 In short, Waffle House isn’t the glamorous upscale place you go to for a fancy meal. But if you want great tasting fast food that won’t set you back much, this is the place to be.